Larch Corrections Center opened in 1956. It is a minimum security prison that houses a maximum of 480 male inmates. The inmate population at Larch consists of two minimum security units, Silver Star and Elkhorn. Inmates can participate in stress and anger management courses, take adult basic education classes and earn their GED. Larch Corrections Center participates in a cat adoption program that aims to socialize cats who are deemed unsocial or dangerous through the offender retraining the cat. Once the cat has been re-socialized it is returned to the Humane Society for adoption. Inmates at Larch Corrections Center are provided medical, dental and mental health services. Additionally, offenders can take vocational training in automotive service and repair, electrician training and certification, and wastewater treatment certification. Inmates can join religious worship services, and participate in Alcoholics/Narcotics Anonymous meetings held at the facility. Offenders can also join community work crews, which provide supervised labor to various agencies in the surrounding area. Larch Corrections Center utilizes a rotating visiting schedule. Elkhorn and Silver Star Units alternate weekly between morning and afternoon visits. Visits occur on Saturdays, Sundays and Mondays from 8am-11am and 1pm-4pm (check in occurs at the top of each hour). 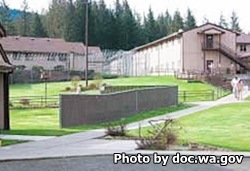 View the current visitation schedule for Larch Corrections Cente here. For more information about visiting read the visitors guide for Larch Corrections Center.